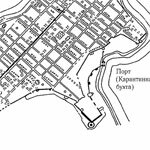 A large-scale construction in Chersoneses in the 6th century or the influence of the tradition on the idea of the age of Justinian I? – doubts have been raised that if the 17 basilicas discovered on the territory of the fortress were to be dated back to one of the chronological periods of Chersoneses, a continuous construction activity would have been required over a long period. It is deemed unlikely that a settlement of 5500-7000 inhabitants had the necessary resources for an activity of this scale. In support of this argument, data is presented from the capital cities of the First Bulgarian Kingdom in which religious buildings were constructed for a period of 100-120 years. Data suggests that the financial and human resources in these cities were considerably higher, and the number of the temples in each capital city was lower than the number in Chersoneses. This leads to the conclusion that the temples which stopped functioning in the late 10th or the early 11th century were constructed between the 5th and the 10th century. In this case, the inaccuracies in the dating during the archaeological excavations do not allow to establish with certainty the time of construction of each of the unearthed religious complexes in the ancient Chersoneses.